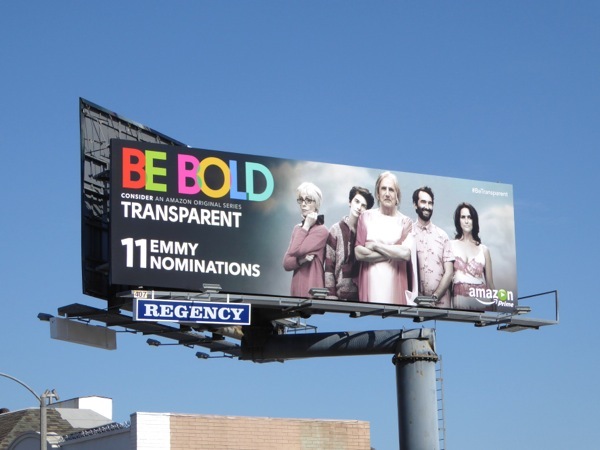 At the beginning of last week you saw all the billboard support that Netflix was giving its Emmy nominated shows in 2015 (and there was a lot), and today to kick off another TV WEEK here at Daily Billboard it's time to catch up with the other studios, channels and networks to see what out-of-home ad campaigns they have to garner Emmy voter attention. 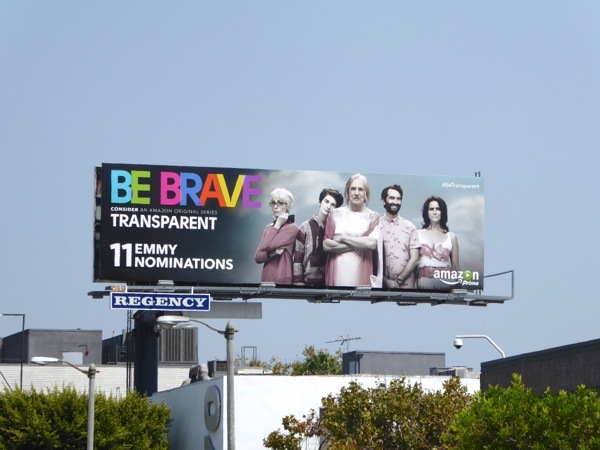 Amazon's critically-acclaimed Transparent had a wonderful Emmy consideration campaign featuring a variety of key moments from the first season and for their Emmy nomination billboards they've chosen one central image, the 'Pfefferman' family, with powerful multi-coloured headlines like 'Be Bold', 'Embrace' and 'Be Brave'. 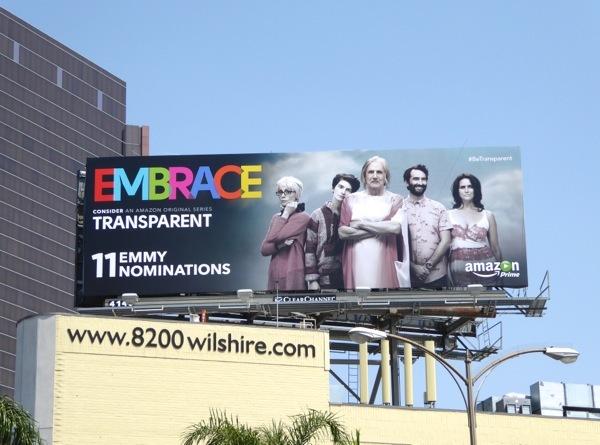 These Transparent billboards were photographed from August 13 to August 19 along the busy Sunset Strip, Wilshire Boulevard and Beverly Boulevard, and with all those nominations maybe the groundbreaking series about a father coming out as transgender to his family later in life will be taking him some Primetime Emmy Awards to add to their collection of Golden Globes and other accolades. Another show that shone last season was Fox's music business drama, Empire. 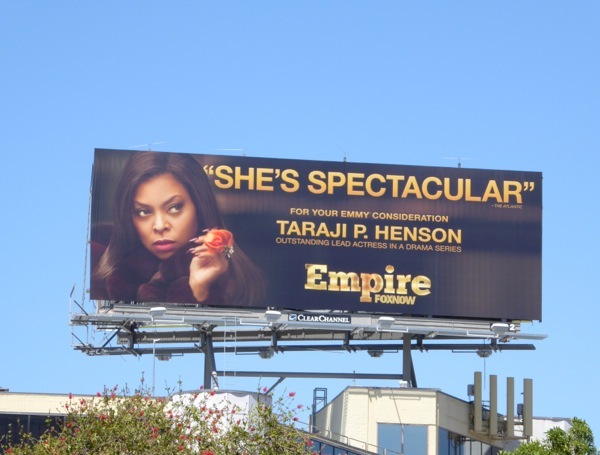 And bringing most of the drama was Taraji P. Henson as the instantly iconic 'Cookie Lyon', so it's no wonder the actress was nominated for Outstanding Lead Actress. 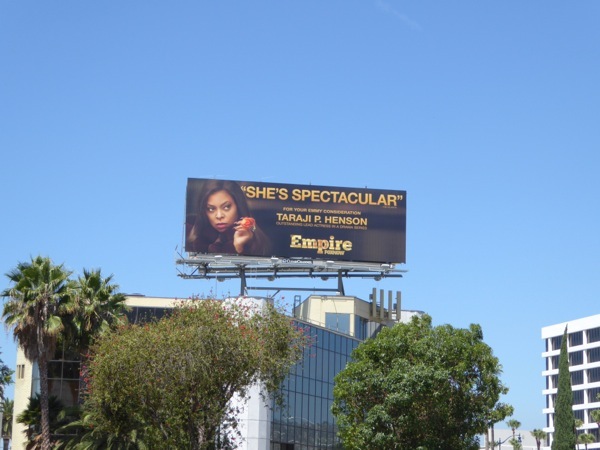 This 'spectacular' billboard was spotted high above San Vicente and Wilshire Boulevards on August 15, 2015 to help raise the star's profile. 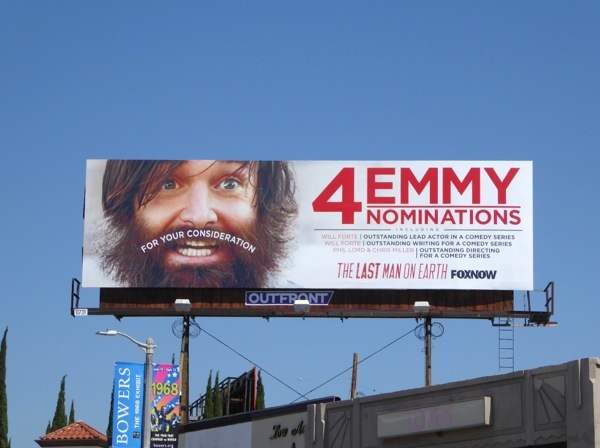 Another Fox show that was a hit with the TV Academy and audiences this year was The Last Man on Earth, where Will Forte discovered he wasn't the only survivor when the rest of the human race was apparently wiped out. 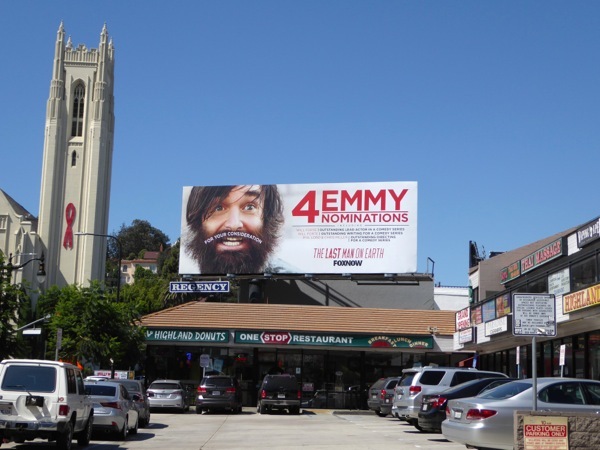 These fun moustache-themed billboards for the Emmy nominated comedy were snapped along La Brea Avenue on August 12 and also along Highland Avenue on August 16. In the world of reality competition shows, So You Think You Can Dance proved that even if you're in your twelfth season you can still sashay, grand jeté and body pop your way to eight Emmy nominations, including one for Cat Deeley as Outstanding Host. 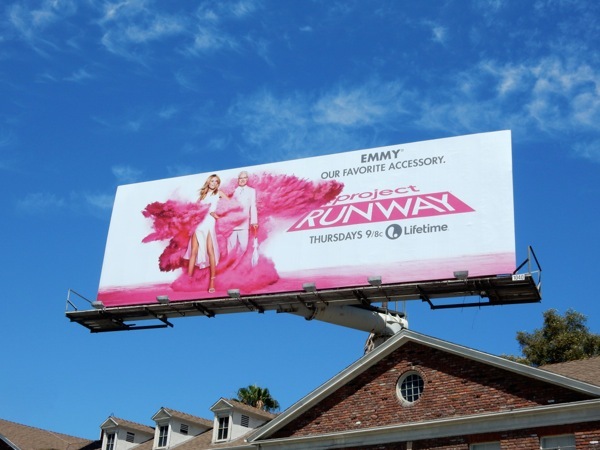 This SYTYCD Emmy nomination billboard was spied at the intersection of Fairfax Avenue and Beverly Boulevard on August 13, 2015. Speaking about reality competition shows with longevity and Project Runway was back for its fabulous fourteenth season this Summer. 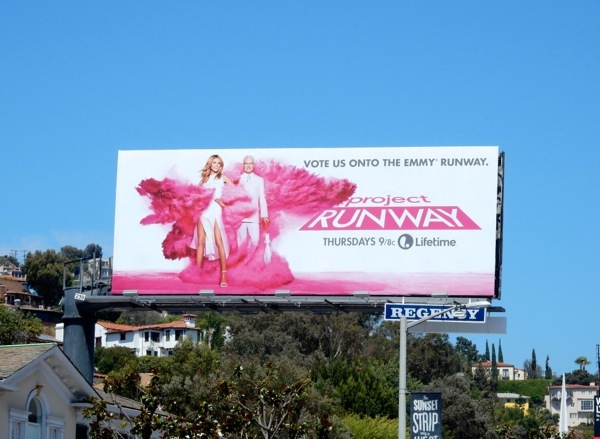 They used these colourful new season billboards, photographed along Sunset Plaza, Cahuenga Boulevard and San Vicente Boulevard on August 1, to also campaign unashamedly for Emmy votes, with Heidi Klum and Tim Gunn both in the running for co-hosts of Lifetime's fashion design talent show. From a penchant for fashion to a talent for escapology, and Adrien Brody is up for consideration for his titular role in History's Houdini mini-series. 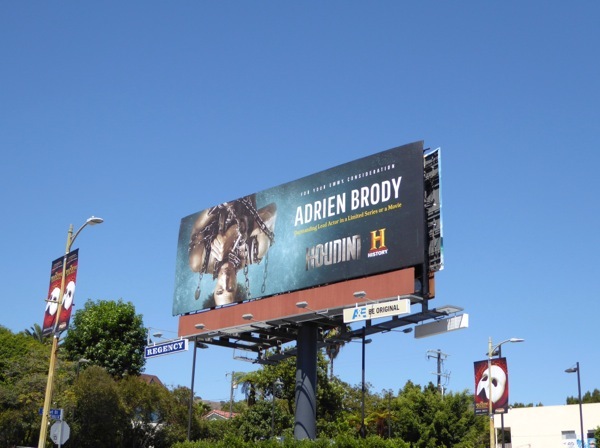 This underwater upside-down ad creative was spotted trying to get your attention along the Sunset Strip on August 15, 2015. 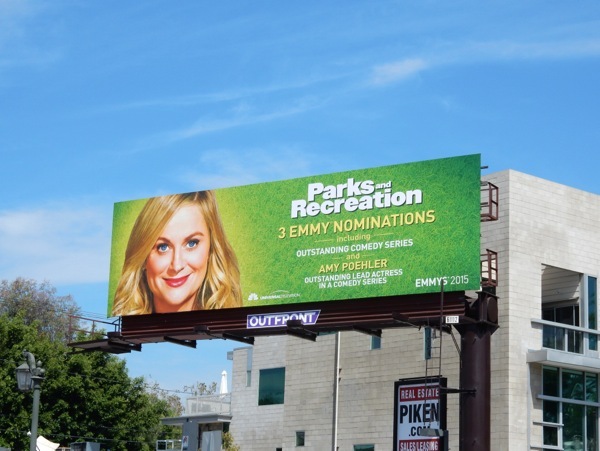 Next up is Amy Poehler and her sitcom, Parks and Recreation, no doubt hoping to take home some coveted awards after their seventh and final season. 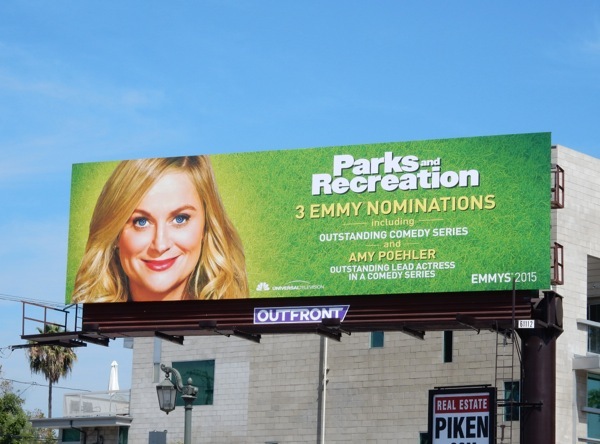 This grassy green billboard featuring the funny lady is the perfect background for the parks department comedy and was snapped on August 3 along Melrose Avenue. 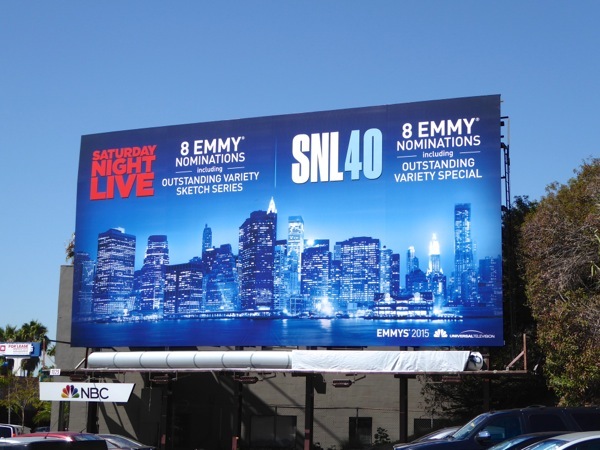 This is just one of the shows that is produced at Universal Television that appears to have received some Emmy nomination support in the city skyline at moment (in addition to the Unbreakable Kimmy Schmidt which streams on Netflix), so be sure also check out the extensive Universal Television Emmy consideration billboard campaign from earlier this Summer. Amy Poehler was also one of the classic Saturday Night Live cast members that returned for the 40th anniversary special that aired in February this year, along with a whole host of famous names, comedians and celebrities. 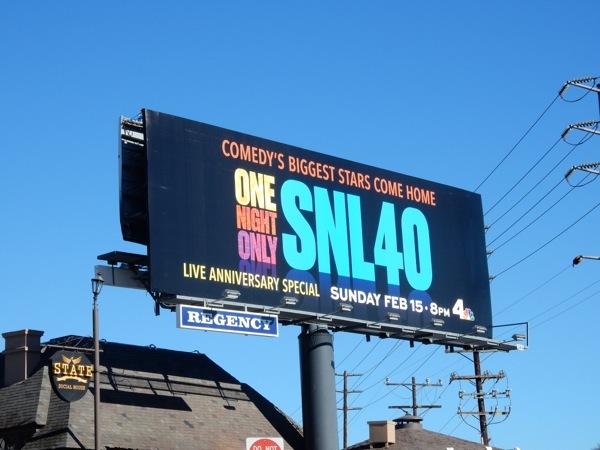 This 'One Night Only SNL 40' billboard was snapped back on February 9 along the Sunset Strip, whilst the Emmy nomination billboard for the iconic variety sketch show and the special was photographed on August 13 further east along Sunset Boulevard. The battle for late night talk show supremacy seems one of the most fierce categories in television at the moment, with many hosts retiring or leaving shows after many years and others changing chairs to helm long established shows, like Jimmy Fallon did when he joined The Tonight Show at the start of last year. 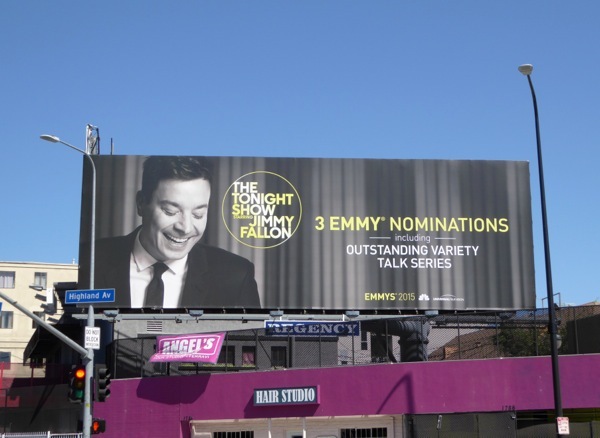 Obviously the move paid off as these 2015 Emmy nomination billboards prove, spied along Highland Avenue on August 15 and along the Sunset Strip on August 23. 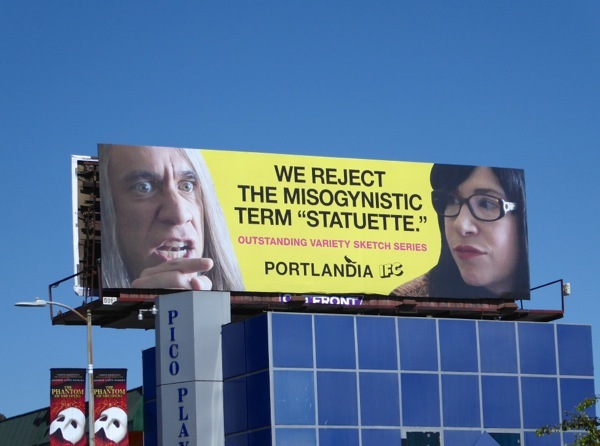 Portlandia had one of the funniest Emmy consideration billboards earlier this Summer and for their nomination billboard the sketch show in its fifth season continues to display its own unique brand of humour. 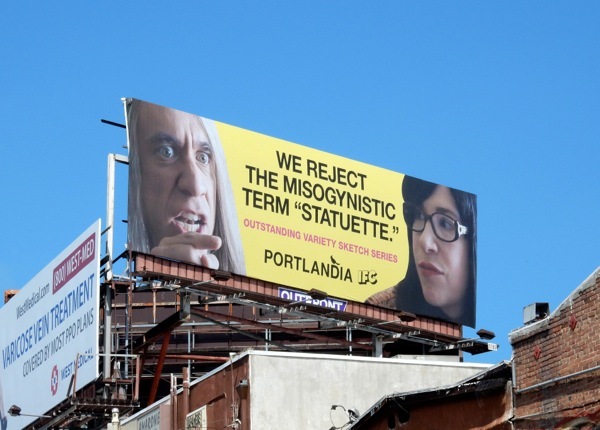 They may 'reject the misogynistic term "statuette"' as these billboards snapped on August 12 along the Sunset Strip and Pico Boulevard suggest, but Daily Billboard is certain the IFC comedy series won't be turning away any awards they may win. 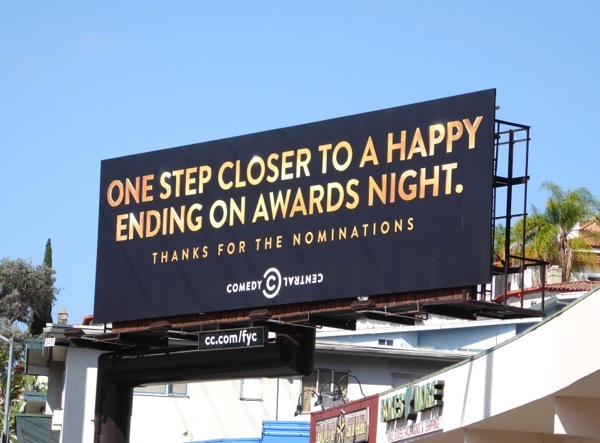 And finally this fun Comedy Central billboard is the perfect way to close this snapshot of Emmy nomination billboards around L.A. at the moment. 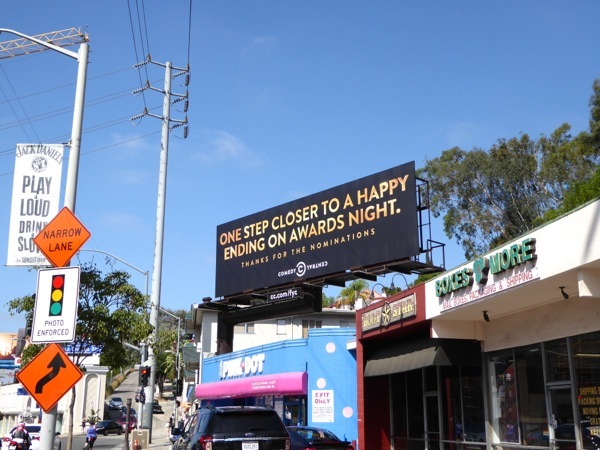 This wonderfully tongue-in-cheek 'happy ending' billboard was captured on August 20 along Sunset Boulevard in West Hollywood. Who will win, and who will go home without a happy ending? Only time and all this campaigning will tell we're sure. 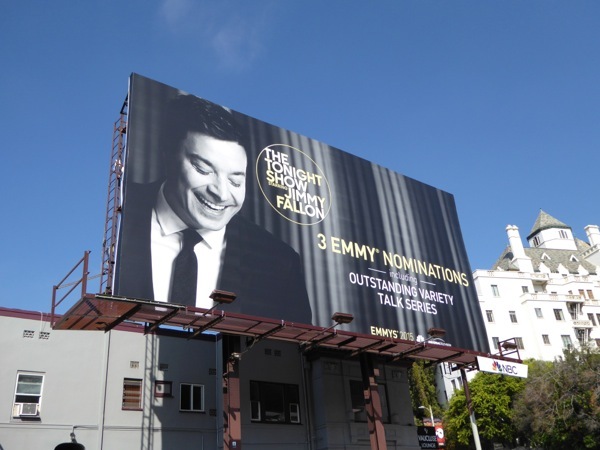 We'll keep our eyes to the skies, as Daily Billboard is positive there are more Emmy nomination ads lurking out there waiting to be discovered, plus stay tuned the rest of this week to get a glimpse at some of the new shows debuting this Fall season.